The shortest month in the year and always a great month to make achievable goals (like spending less, not going to Old Navy, maybe eating something healthy...) and falling in love with the colors red, pink and white all over again. When I was growing up... Valentine's was lame. It was a pagen holiday that just made you feel ugly and unwanted. I liked Valentine's day for the sole purpose that at Midnight on the 14th at Wal-Mart all that yummy candy went 50% off. Boo-Ya! Now that I'm married... Valentine's day is an occasion for all restaurants to mark up their prices and a day guaranteed I'll get flowers from my hubby. While it's cute... everyday should be Valentine's when you are married so it isn't something we get super excited about. Especially since we never celebrate on Valentines for the above restaurant reason. So, now you are wondering why I'm even posting about it or talking about it since I'm so blase about it. Well... I learned I could DECORATE for it!!! And it looks pretty darn cute. 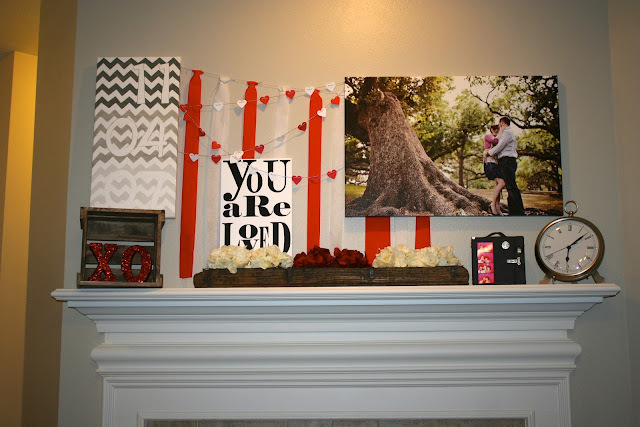 Red is already a predominate color in my home so with some add-ons of some awesome printables, red hearts and a new mantle scheme, Valentine's is now pretty!! Whether you are single or married, if you have some extra time to be silly and play with glitter and heart punches now is the time to go for it. Check out some of the decor going around the McCarty Household and maybe it will inspire you to add a little glitter and red during this short month. 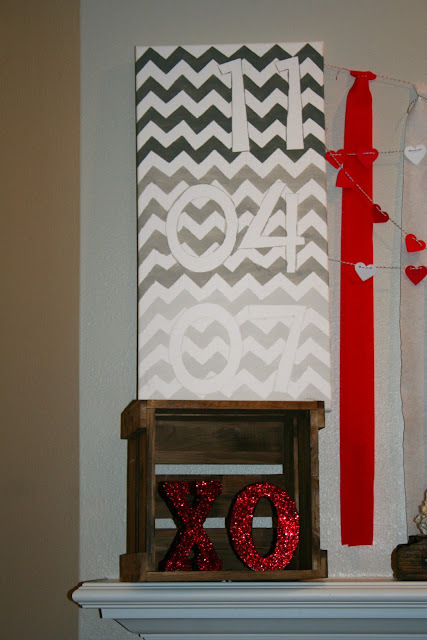 This is just a canvas I got on sale at Michael's, used my Cricut to cut out my Anniversary and brushed on this chevron design! The XO came from this adorable site and it's always fun to play with glitter. You can never have enough subway art. This I got for free off Pinterest and they have a ton more to choose from! !